Cath Roberts – alto saxophone, compositions; Tom Ward – tenor saxophone ; Henry Spencer – trumpet;Magnus Dearness – trombone; Dave O’Brien – keyboards; Jason Simpson – bass; Olly Blackman – drums. 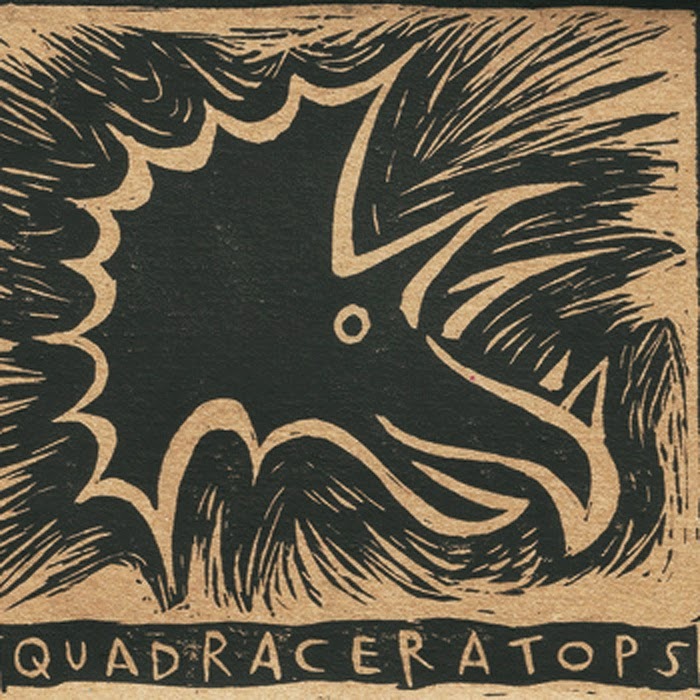 This is composer and band leader’s Cath Roberts debut album with her septet Quadraceratops named after a fictitious dinosaur who, like the band, has four horns. Dinner with Patrick gets the album underway - a horn dominated rumble which ebbs and flows in almost ‘Mingus’ like fashion. Song for the Worker Bee features a hypnotic minimalist Fender Rhodes solo from Dave O’Brien before the haunting trumpet of Henry Spencer kicks in. The whole track is set against a background of driving drums and bass. Chair-O-Planes has a stirring melody with some solid soloing by Roberts, Dearness than contributes a smashing solo on the trombone before the piece concludes with the same cheery theme by which it had begun. Open Sandwich is carried along by Simpson’s funky double bass another ethereal Rhodes solo from O’Brien cranks up the piece allowing the horns to really get going. Spiderling is a slower more delicate number with O’Brien on acoustic piano and the horns providing an erringly sinister backdrop. Calico is dominated by Spencer’s soaring trumpet with the whole ensemble squawking away together before culminating in a gentle piano led finale. Flying South concludes this album with all soloists getting their chance to shine. Trombonist, Dearness and bass player, Jason Simpson taking the honours along with drummer Olly Blackman who keeps things going throughout the entire album. This a fine piece of modern British jazz with excellent compositions and arrangements from band leader Cath Roberts. I expect the band to get better and better as they play together and imagine they would be a very fine outfit to see live. Tubby Hayes - A Man in A Hurry. Jazz Café Jam Session - January 20. Paul Skerritt Band @ Hoochie Coochie. January 18. DB Jazz Project @ Jazz Café January 16. Secret Love's no secret any more. CD Review: Tom Green Septet - Skyline.